MenaQ7® is essential for the body to utilize calcium to build healthy, strong bones and to inhibit calcium deposits in the arteries, which causes hardening of the arteries. MenaQ7® is the trusted source of natural vitamin K2 and is shown to be safe and effective at 45, 180 & 360 mcg daily. It is the only product that is clinically proven – in children and adults alike – and the only natural vitamin K2 to have earned the VitaK2™ Seal of Quality and Efficacy from the world’s leading experts in vitamin K. MenaQ7® is the only FDA Patented vitamin K2 for cardiovascular healh. • K vitamins are essential to utilize calcium in the body. The existence of vitamin K1 was first demonstrated by the Danish scientist Henrik Dam in early ’30 of the 20th century. He was studying diets in chickens and noticed that his flock was suffering from frequent haemorrhages. He postulated that there had to be a factor in the diet which prevented the bleeding. After extensive research this unknown substance was identified, and named factor K – K for the Danish word for coagulation. The nature of this vitamin was revealed several years later – in 1939 – by another scientist, Professor Edward A. Doisy of St. Louis University School of Medicine, US. He was able to describe the molecular structure of this K factor, and to synthesise not only one molecule but several closely related molecules. In this way it was discovered that vitamin K consisted of two groups of molecules; K1 and K2. In relation to biological effects, it is important to be aware that the molecular difference between K1 and K2 gives different biological properties. Since its discovery in 1930, it has been thought that blood coagulation was the only function, in which vitamin K is involved. During the last decades, however, it has been found that vitamin K also plays an important role in bone and vascular health. K vitamins are a group of fat-soluble vitamins. The two most important forms are Vitamin K1 (phylloquinone) and K2 (menaquinone). Vitamin K1 is needed for proper blood coagulation whereas Vitamin K2 is essential to build and maintain strong bones as well as to avoid calcium deposits in the arteries. Vitamin K2 exists in several forms and the most common ones are the synthetic menaquinone-4 (MK-4) and the natural menaquinone-7 (MK-7). MenaQ7® is a well documented, safe and effective natural vitamin K2 (MK-7). The function of K vitamins is unique among other vitamins. It activates certain proteins that are made in different organs in the body such as clotting factors in the liver, osteocalcin in bones and Matrix Gla Protein (MGP) in vasculature. These proteins help coagulate blood, bind calcium to the surface of bones and inhibit calcium deposits in the arteries. Without vitamin K these proteins remain inactivated and therefore not functioning properly. Current daily recommendations for K vitamins are based exclusively on vitamin K1 and the requirement for proper blood clotting which is set to be 1 μg K1 per kg of body weight (daily). This amount is not sufficient for the optimal function of other tissues like bone and vasculature which require K vitamins as well. Hence, the majority of both children and adults stay vitamin K deficient. The general name of vitamin K comprises not only of one molecule, but also of two classes of molecules. The coagulation vitamin K1 is only one molecular form – phylloquinone – while K2 represents family related molecules – the menaquinones. MenaQ7® belongs to the menaquinone family of K2 molecules, which recent year’s studies have proven to be the optimal vitamin K2 due to its superb bioavailability and biological activity. MenaQ7® is the brand name for menaquinones-7 or MK-7. Vitamin K1 is synthesized by plants and algae, and is found in green vegetables, especially spinach, broccoli and kale. Vitamin K2 group is not produced by plants but by various types of bacteria. The K2 variants can thus be found in bacterial fermented food products, however there is very little Vitamin K2 in meat, fish or fresh fruits. The traditional Japanese meal Natto, made of fermenting soybeans by bacteria, is especially rich in Vitamin K2 (especially in MK-7). Fermented soybean product Natto is a natural source of MK-7. 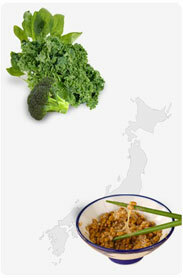 Natto is a Japanese breakfast food that has been traditionally eaten for over 1000 years. Studies in Japan have linked vitamin K2 to a reduction of cardiovascular disease and could explain lower levels of heart diseases in Japan. Additionally, several Japanese studies have been published on the effect of nutritional MK-7 intake and bone health. At a regular intake of nutritional doses of MK-7 from Natto, long half-life of MK-7 leads to an accumulation in extra hepatic tissues that may only be reached with much higher and more frequent doses of synthetic MK-4. Human cells are not able to synthesize vitamin K2 and present knowledge strongly indicates that western diets do not contain enough Vitamin K2. Even if you eat a lot of green vegetables, you do not get enough vitamin K1 or K2. This is due to several factors, most important of which is that vitamin K1 is not effectively released (only about 5-20%) for absorption in the intestines, and secondly because the amount ingested is rapidly cleared by the liver and excreted. Consequently, vitamin K1 will not stay long enough in the circulation to reach peripheral arteries or bone cells in sufficient amounts for optimal action. Vitamin K2 and particularly MenaQ7® on the other hand, has a better bioavailability, and studies show that this molecule remains in the body for a longer period and is more effective at lower doses, hence is much more bio-effective. All vitamin K variants at recommended doses are safe in healthy humans. MenaQ7® has been consumed in large doses in the dish Natto – as MK-7 – in Japan for hundreds of years without any reported adverse reactions. Bone health is closely linked to the strength and flexibility of bone structures. However, bones are living tissues which are composed of, amongst other factors, cells which build up the stiff hydroxyapatite skeleton (osteoblasts), and cells which break this skeleton down (osteoclasts). The building of bones is a complex process with many contributing factors in tightly regulated sequences. As we get older we are used to seeing that the skeleton deteriorates. Old people shrink in height; bones get more brittle and vertebra often change shape. In our minds this is a natural process; however, when people start breaking their ribs, their hips, wrists or get breakage in the vertebra, osteoporosis is often diagnosed. Osteoporosis is thus a disease in which the density and quality of bone are reduced, leading to weakness of the skeleton and increased risk of fracture. Osteoporosis and associated fractures are painful, often requiring hospitalization and are a frequent cause of morbidity and mortality. Osteoporosis is a global problem that is increasing in significance as the population of the world both grows and ages. Worldwide, lifetime risk for osteoporotic fractures in women is 30-50%, in men the risk is 15-30%. Three main types of osteoporosis fractures are wrist fracture, vertebral fracture and hip fracture. Osteoporosis is often called the “silent disease” because the bone loss occurs without symptoms. In many cases, the first “symptom” is a broken bone. Patients with osteoporosis may not know that they have the disease until their bones become so weak that a sudden strain, bump, or fall causes a hip fracture or a vertebra to collapse. Collapsed vertebra may initially be felt or seen in the form of severe back pain, loss of height, or spinal deformities such as kyphosis, or severely stooped posture. More than twenty years ago Hart postulated that vitamin K is important for bone health (1984). He found that circulating vitamin K1 concentrations in 16 patients with hip fractures were extremely low. This observation was later confirmed by others who correlated fracture risk with serum osteocalcin carboxylation or dietary vitamin K1. Most published papers have found an association between vitamin K status and bone mineral density (BMD). However, only a limited number of intervention studies have been published testing the effect of K1 on bone. A general trend is that K1 (in ranges between 250 μg up to 10 mg/day) alone improves osteocalcin carboxylation, but has little effect on BMD . In combination with calcium and vitamin D, a moderate effect of vitamin K1 on BMD has been reported (35% less bone loss than with calcium and vitamin D alone). In a large number of Japanese studies, K2 has been tested in high doses (45 mg/day). With these doses vitamin K is not used as a nutritional supplement, but as a pharmaceutical drug. Obviously, the extremely high K2 intake resulted in maximal osteocalcin carboxylation. In a randomised placebo-controlled vitamin K2 intervention trial among 340 Caucasian postmenopausal women, it was demonstrated that K2 (45 mg/day during 3 years) had little effect on the BMD, but induced an increase of the BMC and showed that bone strength at the site of the femoral neck did not vary during the entire duration of K2 treatment, whereas in the placebo group there was a significant and consistent decline of bone strength. Re-examination of the DXA scans of previous vitamin K1 trials did not show such an effect for vitamin K1! Calcium has for decades been the most obvious choice of dietary supplement for improving bone health. The large majority of calcium (99%) in our bodies is in our skeleton and some in teeth, only 1% is found in the circulation. We need calcium to keep up with the turnover of the skeleton. However, we also require that the body can optimize the use of calcium. Too much calcium also seems no good. Several studies show that supplementing with calcium is not enough for optimal bone health. Adding vitamin D and vitamin K significantly improved bone health. The scientific rationale and documentation is that vitamin D stimulates the synthesis of osteocalcin, while vitamin K2 is needed for the activation of osteocalcin. Only the vitamin K2 activated osteocalcin will bind calcium optimally. In this way both vitamin D and vitamin K2 work in synergies to make the body able to use calcium efficiently for improved bone health. • Strong bones developed in childhood and maintained afterward reduces the risk of osteoporotic fracture as high peak bone mass buffers bone loss later in life. • Vitamin K deficiency leads to the synthesis of inactive osteocalcin species that cannot bind calcium to the surface of bone. • The majority of adults and children are vitamin K deficient. First, it was blood cholesterol that could give you an early warning that a heart attack might be around the corner. Then came c-reactive protein. And now that doctors can get a better look at what’s inside your heart arteries, they are taking a new interest in something they have always known was present in problem vessels: calcium. Hospitals, clinics and even gyms are touting quick and easy scans that can measure the amount of calcium in your coronary arteries in minutes. Calcium can then build up in the vessels and stiffen them, laying the foundation for heart disease. Getting one’s calcium score is simple, either by electron beam computed tomography (EBCT) or by multidetector CT. Studies show that in every age group people with higher vascular calcium levels have a greater risk of heart attack than do people of the same age with lower scores. Calcium is essential for every cell in the body and plays a number of important roles other than just being used in bone. For example, calcium is necessary for skeletal muscle functions and other muscle tissues such as the smooth muscles in arteries. Imagine your pulse and how the arteries expand and contract. Normal metabolic processes utilize and clear excess calcium from the body. Excess calcification of cells lining the arterial vessel walls can play a role in increasing their stiffness and fragility, impeding normal blood flow to and from the heart. For over half a century, K vitamins were recognized solely as needed for normal blood clotting. However, during the last decades, they have been the subject of significant research. At the same time, protein research identified matrix Gla protein (MGP) associated with soft tissue calcifications. Soon it was realized that MGP was dependent upon vitamin K for activation. MGP is the most potent inhibitor of vascular calcification known, and it is actively involved in recycling calcium. The Rotterdam Study (2004) shows that high dietary intake of vitamin K2 – but not vitamin K1 – has a strong protective effect on cardiovascular health. This population-based study, which took place over a 10 year period, followed 4807 initially healthy men and women >55 years of age from start. Findings from the study indicate that eating foods rich in natural vitamin K2 (at least 32 mcg per day) results in 50% reduction of arterial calcification, 50% reduction of cardiovascular death and 25% reduction of all cause mortality. These findings was in 2008 supported by another population-based study with 16,000 persons from the Prospect-EPIC cohort population. All the women participating in this project, who were aged 49-70 at the start of the study, were followed up for 8 years and were free of cardiovascular diseases at the baseline. The results from this study show that high intake of natural vitamin K2 – but not vitamin K1 – over a 8 year period protect from cardiovascular events. The researchers (Gast et.al) found that for every 10mcg vitamin K2 (MK-7) consumed, the risk of coronary heart disease was reduced by 9%. Another study which looked at the relation between vitamin K1 and vitamin K2 intake and coronary calcification among 564 post-menopausal women showed decreased calcification associated with vitamin K2 intake (specifically MK-7) but not with vitamin K1 intake. An interesting double blind placebo-controlled bone health study from New Zealand where 1471 postmenopausal women received 1000 mg calcium daily reported a high frequency of cardiovascular events. Judged from the information given, it seems that the daily intake of vitamin K2 was very low in these women. Inadequate vitamin K2 supplementation seems to be a contributing factor to this cardiovascular problem. Unfortunately, the western diet does not contain sufficient vitamin K2 and supplementing with MenaQ7®, the natural vitamin K2, is therefore recommended by experts. Calcification was once believed to be an irreversible process and a result of aging. However, it is now known that calcium accumulation is an actively regulated process also involving vitamin K2-dependent MGP. Healthy arterial tissues have shown to contain 20-50 times more vitamin K2 than unhealthy arteries. The amount of calcium in the arteries is a risk factor for cardiovascular health. Significant calcification makes one older than what the birth certificate states; while with little or no calcification one can deduct up to 10 years from one’s chronological age. In short, you are as old as your arteries. Impaired calcium metabolism results in simultaneous bone tissue degradation and excessive calcium accumulation in the vessel walls. This is known as the Calcium Paradox. While bones are in need of calcium, excessive calcification may occur in arteries and soft tissues including skin. Vitamin K2 is an essential co-factor involved in calcium utilization by activating proteins responsible for removing circulating mineral from the arteries and binding it to the bone matrix. Matrix Gla Protein (MGP) is a key inhibitor of soft vascular tissue calcification – it can be measured in blood, but exerts its effect in tissues where it binds calcium, preventing it from depositing in the vessel walls. In collaboration with other soluble factors and cells, MGP thus helps remove calcium from the arteries, and thereby keep them elastic and flexible. In order to properly perform its inhibitory function, MGP must be activated by vitamin K during a process called carboxylation. Vitamin K2 deficiency results in undercarboxylation of MGP (ucMGP) and impairs their biological function. Without adequate vitamin K2 in the vessel walls ucMGP accumulates at the sites of calcium deposition but is basically inert as it cannot inhibit calcification, which in turn increases the risk of fatal cardiovascular events. A recent study published by McCann and Ames from the Children’s Hospital Oakland Research Institute (Am J Clin Nutr 2009) confirms the vital role of Vitamin K in the prevention of age-related diseases, including bone impairment and cardiovascular disorders. The outcome of the study underlines that current recommendations for dietary vitamin K intake are not being met – which may result in early development of age-related diseases. A new study has been published by Førli et al. (Transplantation, Volume 89, Number 4, February 27, 2010), scientists at Rikshospitalet, Oslo University Hospital, Norway. The study demonstrated a positive correlation between dietary vitamin K2 (180µg of MK-7) supplementation and improvement of bone health of patients recovering from lung and heart transplantation. According to the WHO, osteoporosis currently affects some 200 million people globally and is second only to cardiovascular diseases as a leading health care problem. Globally, cardiovascular diseases are the number one cause of death. An estimated 17.5 million people died from cardiovascular diseases in 2005, representing 30 % of all global deaths. Natural vitamin K2 (MK-7), is well recognized in scientific literature during the recent decades for contributing to stronger bones and less calcified and healthier arteries. The average dietary intake of K vitamins has dropped significantly over the last 50 years, and today’s intake seems insufficient. Research shows that vitamin K2 is beneficial for both bone and cardiovascular health. Leading experts therefore recommend vitamin K2 supplementation. MenaQ7® is a well documented, safe and effective natural vitamin K2 (MK-7, menaquinone-7) product. Cardiovascular disease are the major cause of death and disability in the Western world. An estimated 17.5 million people died from cardiovascular diseases in 2005, representing 30% of all global deaths. Cardiovascular diseases usually develop over decades where arteries clog and harden from plaque deposits in which calcium is the main mineral component. MenaQ7®, the natural vitamin K2 helps the body to inhibit and “clean up” calcium in the arteries. For decades calcium has been the most obvious choice of dietary supplement for improving bone health. However, several studies show that supplementing with calcium exclusively is not enough. Our bodies need to optimize the use of calcium as excess calcium will stick to the blood vessel walls, making them stiff and less elastic. MenaQ7® is the optimal solution to utilize calcium in the body by binding calcium to the bones. Bones grow and develop most intensively during childhood and adolescence. Binding calcium to healthy bone matrix serves one goal – to maximize bone mineral density in order to maintain bone mass later in life. Without adequate vitamin K, calcium cannot be properly used to build healthy, strong bones. Young bone are highly active and osteocalcin levels are 8 –10 times higher as compared to adults, hence the requirement of vitamin K is also higher. Unfortu¬nately, many children are vitamin K2 deficient and supplementing with MenaQ7®, the natural vitamin K2 is therefore essential. The main safety concerns may seem first of all to originate from less scientific knowledge of this new form of vitamin K compared to the well-known vitamin K1. Introducing a new variant of vitamin K is challenging, especially as vitamin K traditionally has been the physician´s vitamin – with little knowledge among the general public. Moreover, Vitamin K for health professionals seems to be synonymous with coagulation only. And coagulation is a complicated medical field- not easily assessable for the public. However, according to recent scientific documentation vitamin K – and especially vitamin K2 – is linked to how the body utilizes and store calcium through a set of activated proteins. This means that one has to have a much broader perspective than just coagulation. Insufficient vitamin K2 supplementation is now shown to contribute to poor bone and vascular health. At the same time, it is still true that vitamin K is needed for proper activation of several coagulation proteins, and some might fear interference with blood clotting and bleeding. The K vitamin dependent proteins – found in bones and in arteries- contain a certain amino acid (Glu) that is enzymatically transformed (to Gla) by the help of vitamin K. This transformation – or activation- introduces extra negative charges in the molecules. The role of the activated bone (Osteocalcin) and vascular (Matrix Gla protein) proteins are to bind the positively charged calcium to strengthen bones and to clear arterial vessel walls of calcium deposits respectively. Likewise, the coagulation proteins need to bind calcium in order to take part in the coagulation cascade. In this way, vitamin K is a common link the between bone and vascular proteins and the coagulation system. It is thus natural that health professionals ask questions about safety and the use of this recently launched vitamin K product. November 14th, 2008 was a milestone for the development of vitamin K2. The European Food Safety Authority (EFSA) then published the positive scientific opinion on vitamin K2, MK-7 from natto as a dietary supplement and food ingredient. This publication concludes the scientific safety evaluation performed by EFSA and is a solid confirmation to the public that the product is safe and beneficial to human beings. ongoing to establish whether this is the optimal safe dose of MenaQ7® for healthy people or if the dose should be higher in order to achieve even better health effects. Arterial calcification seems to develop more readily in patients receiving oral anticoagulant treatment (OAC) such as warfarin/coumarin as these medicines inhibit the action of K vitamins in the liver. The consequence of these medicines is a reduction in blood clotting activity, making the blood ‘thinner’. At the same time, anticoagulant drugs cause a deficiency of K vitamins in the vasculature, leading to enhanced risk of cardiovascular disease. The prospect of achieving complications like arterial calcification during anticoagulant therapy is not a desirable situation. Scientific discussions are ongoing as to how much K vitamins are needed to both stabilize the OAC treatment as well as preventing arterial calcification. Present studies show that 45 μg MenaQ7® does not interfere with ‘thinning’ medicines, and as such MenaQ7® does not provoke any additional risk of a clot forming inside blood vessels. However, if using the blood-thinning medicines coumarin or warfarin, consult your physician for options, and under their care, consider supplemental with MenaQ7®. MenaQ7® is approved by the FDA (Food and Drug Administration ) and EFSA (European Food and Safety Authority). December 2008 MenaQ7® has obtained a Food & Drug Administration (FDA) “Self-affirmed GRAS” (Generally Recognized as Safe) approval for use in the USA. March 2009 Approved by the EU committee as novel food.